A sensational bowling performance by Stephen Croft on his debut set up a convincing victory over Hertfordshire at Tring Park over the last three days. 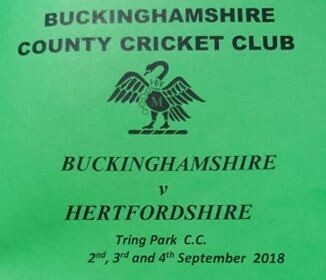 The 21-year-old Harefield leg-spinner, playing his first Unicorns Counties Championship match for Bucks, returned the truly amazing figures 8-33 from 22 overs, as we finished our Eastern Division campaign on a high note. Skipper Tom Hampton’s decision to bowl first appeared to pay dividends when Hertfordshire slumped to 82-7 on the first morning. But Andrew Neal’s unbeaten 78, with excellent support from batsmen 9, 10 and 11, helped them to recover to 244, with Hampton capturing 5-60. The Bucks reply followed a similar pattern, as we slipped to 160-8 before Cameron Parsons (50) and Hampton, with 69 off just 49 balls, lifted us to 272 all out – a first-innings lead of 28. Hertfordshire’s second innings was progressing serenely at 162-3, when Croft, having already picked up two of the first three wickets, changed ends and turned the game around with a devastating spell. He induced a collapse that saw the visitors’ last seven wickets fall for 23 runs, to be all out for 185. Although the pitch was showing the normal signs of wear, which would be expected late on the second day, it was by no means impossible to bat upon; Croft’s figures were the result of good bowling. This left Bucks 158 for victory and the openers survived a nervous 20 minutes at the end of the second day. There were no dramas the following morning, as AJ Woodland (34) and Masoor Khan took the score to 94, before the departure of Woodland. By the time that Khan was out for 68 with the score at 128 the match was effectively over, and Ed Casterton (40) and Mike Payne (10) saw Bucks home just before lunchtime on the final day. CLICK on the image below to link to our images from day one. If you wish to use our images please take the time to give us an accreditation. Thank you.